I had recently read the Lucky Harbor series by Jill Shalvis , also published by Grand Central Publishing and I adored the books! 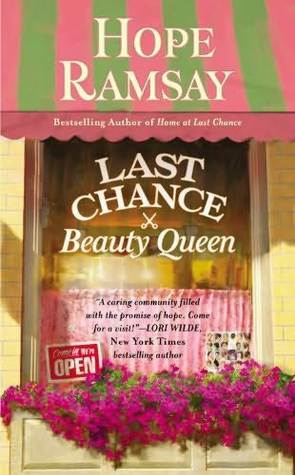 So you can assume that the bar was set pretty high for Last Chance Beauty Queen, Book #3 in the Last Chance series by Hope Ramsay. This book revolves around Rocky aka Caroline, a former Last Chance Beauty Queen, who left her small town for bigger things. She's a woman who knows what she wants and has worked for it. She actually reminded me a little bit of Reese Witherspoon from the movie Sweet Home Alabama. Then there's Hugh, the hot male lead who's looking to build a factory in Last Chance on the land that Rocky's father owns but refuses to give up, which obviously put Rocky in an awkward situation. Predictably, Rocky feels insecure at having to take Hugh to her home town thinking that Hugh might look down on her but being the perfect hero, he surprised her. Together, they made a rather sweet and adorable couple. Last Chance Beauty Queen is a pretty standard contemporary romance novel with a cute plot, good characters, a zany sense of humor and a likable pairing that's perfect when you're looking for a comfort read. While Last Chance didn't meet the standards I expected, it did have most of the feel-good that I look for in a romance novel. Hope Ramsay does a pretty good job of making you feel the charm of a small town.